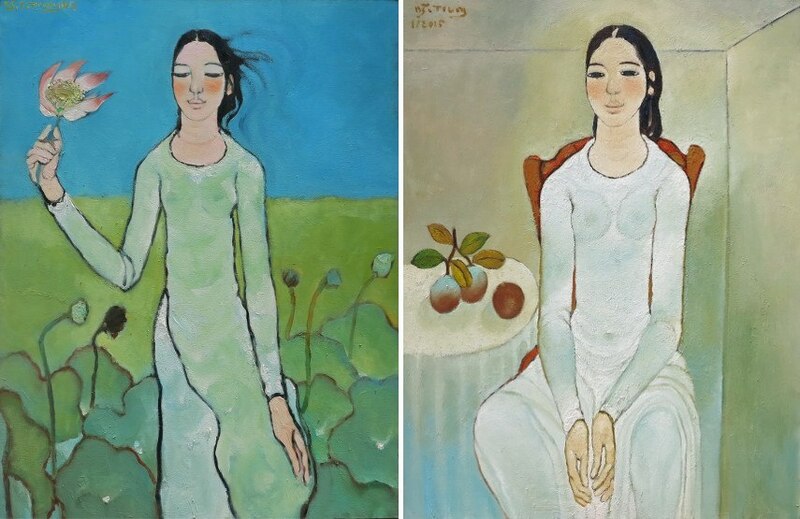 Nguyen Trung is one of the most influential and prominent artists in Vietnam today, where he was born in 1940. Nguyen studied at the Gia Dinh Fine Arts College, and his works can be seen in the Fine Arts Museum in his home Vietnam, the National Museum of Singapore and in many private collections both in Vietnam and abroad. 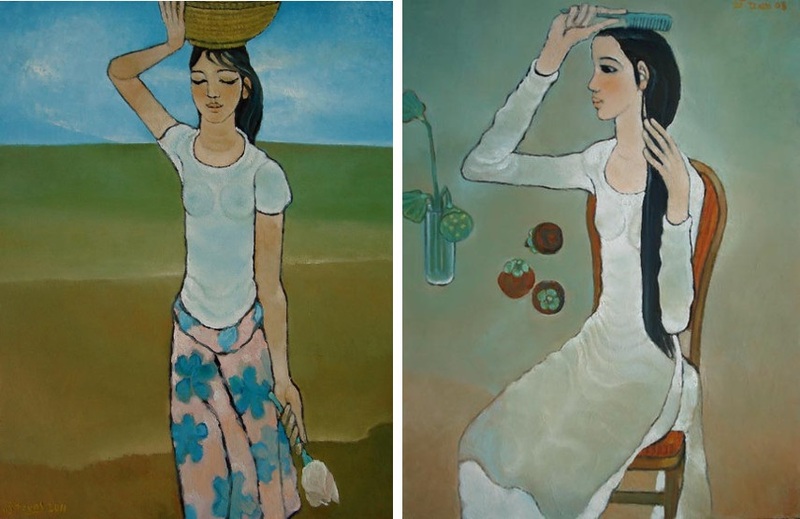 He is one of the few Vietnamese artists whose works are sold in international auctions. From the starting point in his career, he has won many awards that served as an acknowledgment of his artistic aspirations. In 1961 he won the silver medal at the Saigon Spring Exhibition and a gold medal in 1963. Continuing his work, Nguyen had his first solo exhibition in 1967 at the Vietnamese – French Association in Saigon. This was only the beginning of a number of his exhibitions as well as prizes won. With this strong character in his paintings, Trung started something new in Vietnamese art. 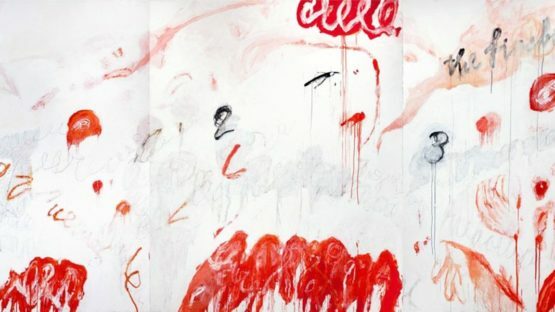 Over the last decade, he initiated a new current of abstract art. Staying within the margins of European rationalism and its strictness, he adapted the style to his region’s inclinations. He placed it within the philosophical frames of Orient, staying true to his origins and tradition. Over time, this abstract style faded and made way for clear figures of realism. Trung’s portraits of girls are mesmerizing in their simplicity. As his career was blooming during the 70’s, Trung co-organized the Saigon Association of Young Painters. Even this early in his career, he was recognized as one of the outstanding representatives of painting in Saigon, and this continued to present day. Nguyen is dedicated to oil painting, with a development path from abstract art to realism. Over the years, Trung’s works became accepted further from borders of Vietnam. the prestigious collection of the Vietnamese Fine Art Museum, the Singapore Art Museum and the Bassano del Grappa Fine Art Museum in Italy. His international exhibitions took place in Singapore, in 1992 and 1995, Japan in 1996, Korea in 1997 and 2000, Italy, France, and the United States in 1998, Taiwan in 1999, and Thailand in 2001, at Thavibu Gallery. His captivatingly beautiful works show well-organized textures. The pastel colors convey balance and steadiness of ideas which preceded the creation of the artwork. It is their individuality and decisiveness that give them a special allure, and a sense of purpose. This innovative artist implemented a new art current to Vietnamese art scene and is often referred to as an abstract expressionist. Having lived in Paris and Cambodia, Trung summarized these different energies and cultures and epitomized his life experience into his intriguing artworks. Often finding inspiration in the Buddhist line of thought, his works emanate spirituality intrinsically to his culture. This spiritual aesthetics makes his art distinctive. In recent years, Nguyen is going back to his roots – abstract painting. Nguyen Trung lives and works in Ho Chi Minh City, Vietnam.